The first-ever guide to The Raiser's Edge database package for the fundraising professional, Fundraising with The Raiser's Edge: A Non-Technical Guide educates your nonprofit about what The Raiser's Edge can do for you and will help you more effectively work with the staff who are responsible for data entry and output. 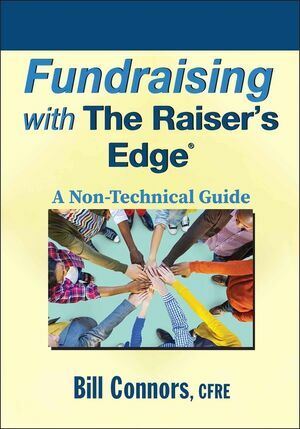 Providing you with the non-technical details you need to know to recruit, manage and retain quality database personnel, Fundraising with The Raiser's Edge: A Non-Technical Guide will help you in your day-to-day fundraising work without needing to become a database expert. BILL CONNORS, CFRE, is an independent consultant and trainer on the Blackbaud fundraising software The Raiser's Edge. Until June 2005, Bill was Principal Consultant for Fundraising Systems for Blackbaud, having helped found the Blackbaud consulting program in 1998. He has been providing consulting and training on The Raiser's Edge in the United States, Canada, the UK, and Europe since 1995. Bill also worked for Junior Achievement as the Director of Development in Arizona and as Director of Field IT for the national headquarters, overseeing the roll-out of The Raiser's Edge in the field offices. Getting Started with The Raiser's Edge. Accessing Campaign, Fund, and Appeal Records. Defining Campaign, Fund, and Appeal. CHAPTER 2 Prospects, Donors, and Other Constituents. Who Should Be Recorded in The Raiser's Edge. Who Should Be a Constituent. Constituent Tabs for Optional Modules. CHAPTER 3 Gifts and Giving. CHAPTER 4 Direct Marketing and Other Mailings. CHAPTER 5 Events and Membership. Events and Membership in Context. CHAPTER 6 Major Gifts and Grants. Basic Major Gifts Fundraising Tools. The Life Cycle of a Major Gifts Donor in The Raiser's Edge. A Word to Corporate and Foundation Fundraisers. CHAPTER 7 Reporting, Lists, and Other Output. Dashboards and Reports to Run. Event, Membership, and Volunteer Reports. Database Administrator Roles and Responsibilities. Version 8 of The Raiser's Edge. APPENDIX A Converting to and Implementing The Raiser's Edge. Conversion and Business Process Development. APPENDIX B Database Administrator Task List. APPENDIX C Policy and Procedure Documentation Example: Generating Direct Mail File. Marking Appeals and Packages on Constituent Records.